The First Steps of Jesus, Unknown French, c 1300. Getty Museum. Christ among the Doctors, Giotto di Bondone, 1304-06. Christus Rex. Disputation with the Doctors, Duccio di Buoninsegna, 1308/11. Web Gallery of Art. Christ Returning to His Parents, Simone Martini, 1342. Web Gallery of Art. The Miracle of the Clay Birds, Shorthampton, Oxfordshire, 15th century. Medieval Wall Painting in the English Parish Church. Jesus among the Doctors, Unknown German, c. 1400-10. The Getty Museum. Jesus Among the Doctors, Fra Angelico, c. 1450. Olga's Gallery. The Christ Child Blessing, Andrea Mantegna, 1480/90. National Gallery of Art. Christ among the Doctors (Missal), Degli Attavanti Attavante, 1485-87. Web Gallery of Art. Christ Child with a Walking-Frame, Hieronymus Bosch, 1485-90. Olga's Gallery. Christ Among the Doctors, Master of the Catholic Kings, c 1495/1497. National Gallery of Art. Christ among the Doctors, Albrecht Dürer, 1503. Biblical Art on the WWW. Christ Child (with Lamb); Child, Old Man, Machinery, Leonardo da Vinci, 1503-06. Getty Museum. Christ among the Doctors, Albrecht Dürer, 1506. Art Renewal Center. The Young Christ (? ), Giovanni della Robbia, c 1500/1510. National Gallery of Art. Christ among the Doctors in the Temple, Albrecht Dürer, 1511. Christian Theological Seminary, Indianapolis. Christ Among the Doctors, Bernard van Orley, c 1513. National Gallery of Art. Christ among the Doctors, Bernardino Luini, 1515-30. National Gallery, London. 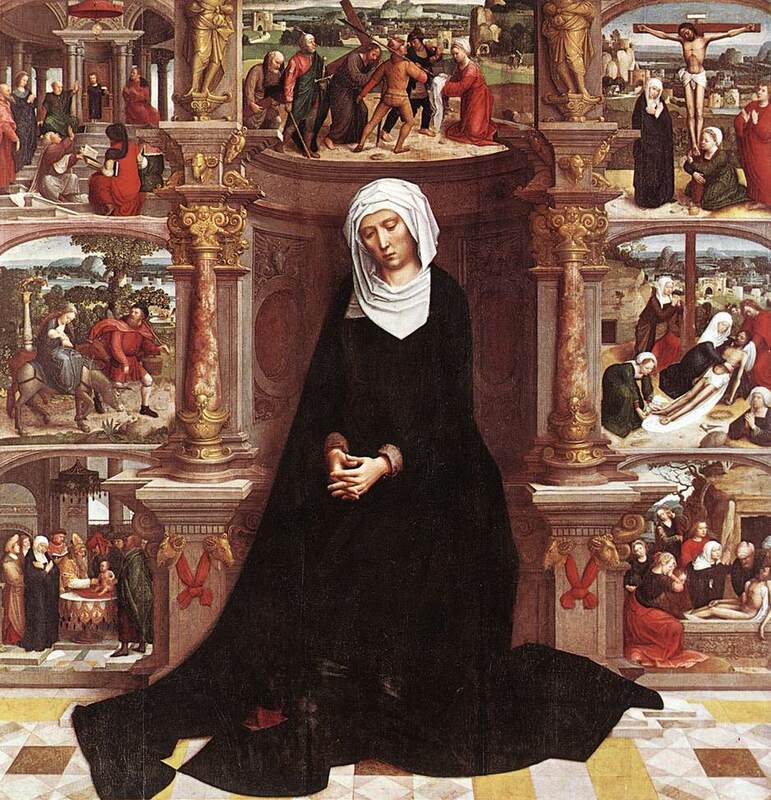 The Loss of the Child Jesus in the Temple (Our Lady of the Seven Sorrows), Adriaen Isenbrant, 1518-35. Web Gallery of Art. Christ Disputing with the Doctors, Luovico Mazzolino, c. 1520-25. National Gallery, London. The Dispute in the Temple, Simon Bening, c. 1525-30. The Getty Museum. Jesus among the Doctors in the Temple, Paolo Veronese, 1558. Web Gallery of Art. St. Joseph and the Christ Child, El Greco, 1597-99. Web Gallery of Art. Christ Preaching in the Temple, Guercino, 1625. Getty Museum. The House of Nazareth, Francisco de Zurbaran, c. 1630. Web Gallery of Art. Christ Disputing with the Doctors, Rembrandt, 1630. The Fine Arts Museums of San Francisco. The Childhood of Christ, Gerrit van Honthorst, 1650. CGFA. 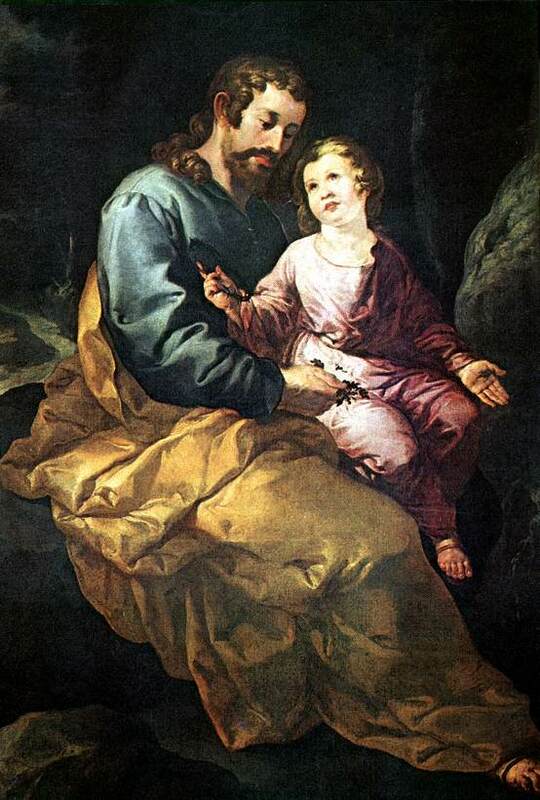 St. Joseph and the Christ Child, Francisco de Herrera the Elder, c. 1650. Web Gallery of Art. Christ Disputing with the Doctors, Rembrandt, 1652. The Fine Arts Museums of San Francisco. Christ among the Doctors, Rembrandt, 1654. Biblical Art on the WWW. Christ Returning from the Temple with his Parents, Rembrandt, 1654. The Fine Arts Museums of San Francisco. Christ Seated Disputing with the Doctors, Rembrandt, 1654. The Fine Arts Museums of San Francisco. Christ Disputing with the Doctors, Gregorio Preti, 1660's. National Gallery, London. The Infant Jesus Distributing Bread to Pilgrims, Bartolome Esteban Murillo, 1678. Web Gallery of Art. Jesus Disputing with the Elders, Juan de Valdés Leal, 1686. CGFA. The Boy Jesus in the Temple, John Linnell, 1843. Tate Gallery. Christ in the House of His Parents ('The Carpenter's Shop'), Sir John Everett Millais, 1849-50. Tate Gallery. The Child Jesus, James Collinson, 1850. Tate Gallery. The Boy Jesus in the Temple, Julius Schnorr von Carolsfeld, 1851-60. World Mission Collection, WELS. The Finding of the Savior in the Temple, William Holman Hunt, 1854. Reproductions and Typological Symbolism (George P. Landow) at The Victorian Web. The Child Jesus Going Down with His Parents to Nazareth, William Charles Thomas Dobson, 1856. Tate Gallery. The Passover in the Holy Family, Dante Gabriel Rossetti, 1856. Tate Gallery. Jesus with the Doctors, Gustave Doré, 1865. Korea Computer Mission. Christ Teaching at the Temple, Carl Bloch, 1875, Hope Gallery. Among the Teachers, Vasiliiy Polenov, 1896. Olga's Gallery. The Christ Child in the Temple, Charles Goldie, 1898-1911. Art Renewal Center. Nazareth, Maurice Denis, 1905. CGFA. The Boy Jesus in the Temple, He Qi, 2002. He Qi's Homepage. My Father's Business, Diana Botkin, contemporary. Missionary Arts. Among the Elders - Judy Garland, "Hymn to Her," collage by Karen Whitehill, contemporary. Viewing Jerusalem, painting and meditation by Fr. Jim Hasse, SJ, contemporary. Holy Family, Jesus the Boy, Joseph's Bird Lesson, Jesus the Boy #1, Jesus the Boy #2, Daniel Bonnell, contemporary. Purchase and Use. Jesus' Birth - Three Kings - Herod - Holy Family - Childhood, Chinese Bible Paintings. Jesus Among the Teachers, African Mafa. Young Jesus, Geoff Todd, Australia. Asian Christian Art Association. Jesus in the Temple, Solomon Raj. Asian Christian Art Association. Jesus Preaches to the Elders in the Temple, St. Joseph's Jersey City. stainedglassphotography.com.